Ours is a kind and friendly place that welcomes travelers from all across the world. We have a wealth of experience hosting travelers of all kinds. From backpackers to adventure motorcyclists, we know what travelers need and value during their stay. 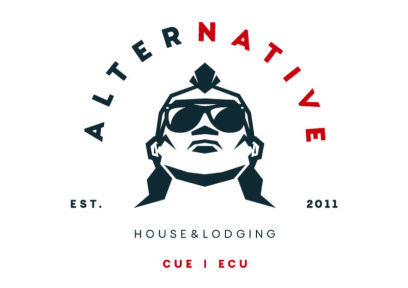 AlterNative Hostel offers its guests a convenient and comfortable location at the corner of Calle Larga and Avenida Huayna Capac. 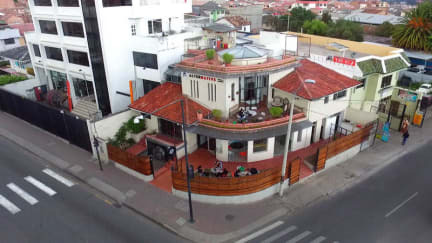 The former is Cuenca's main hotspot for bars and restaurants, and the latter offers fast and easy access to the local airport and bus terminal. We are within walking distance of the historic center of Cuenca, and the Museo Pumapungo is just a few footsteps from our doors. We provide fast 24-hour WiFi in all rooms and common areas. Our hostel has hot water 24 hours a day. In addition to the hostel's shared kitchen, we offer a special discount for breakfast at our specialty coffee house next door, as well as a full all-day menu. Very nice cosy facilities and comfy beds, the location of the hostal was perfect, Stay here!! Wonderful place in the center of the city. Kindly people working in front desk and cafeteria. Excelent attention and good price. Honestly could not recommend this hostel enough! Its a relax pleace, it was great value for money and a great load to meet other like minded travellers from other countries and there are many communal spaces to hang out together. The staff were very friendly and chilled out and helpful. The breakfasts were yummy in the cafeteria (discount for guest) and the facilities were good for the price of the hostel. Location was ideal, a short walk from the city centre and a supermarket. A really clean place with the perfect location to walk around the city. I really recommend it. This hostel is cozy and comfortable. Bathrooms were cleaned twice throughout the day. The water heater is tankless so the hot water doesn't run out. There is secure parking for motorcycles. The cafe next door offers brunch, sandwiches, coffee and alcohol. The front door is kept locked and lockers are available; staff can hold your bags in storage if the lockers are not big enough. I really like the staff, they are friendly and good people. I met two other adventure riders here, which was cool. Loved this hostel. It was super clean, chilled out and had great facilities including a Netflix area where everyone could hang out and a decent kitchen space. Staff were very helpful and you can get a discount in the cafe next door which do amazing breakfasts! Checkout is at 10am, which they will politely tell you that they have 0 wiggle room on. The room was cheap enough though ($12 for a single), so I decided to pay for an extra night just so that I could leave later. Aside from that, the guy at the front desk was really polite and helpful. The room could've used a fan, and if you opened the windows, you'd get a lot of street noise. But aside from those things, I might stay again if Airbnb doesn't have any other good options in the area. Average hostel. Out of the way of most things. No lockers in the rooms. The sheets on the bed smelt funky and didn’t look clean. The staff were nice and were able to help with information on buses. They allowed us to keep our bags in the hostel and chill in the limited social area until we got our night bus. You get a discount at the cafe next door.